What is the best and most common exercise for the development of almost all the muscles of the body? Pull-ups? No! Maybe squats? Also no! Chin-ups? Still no! There is no universal exercise that works out all muscle groups. But reverse grip pull-ups and chin-ups are the most effective upper-body exercises. A chin-up is a form of pull-up in which the range of motion is established in relation to a person’s chin. Both reverse pull-ups and chin-ups are among the best exercises for back and overall upper body conditioning. However, they target the muscles a bit differently. Both exercises will work the latissimus and biceps, but standard chin-ups (with an underhand grip) place more emphasis on the biceps. Let’s consider chin-ups in more detail. Before you read on, make sure that you are not someone who is contraindicated for reverse pull-ups / chin-ups. postoperative trauma in the abdominal cavity. If you have any of these indications, chin-ups can cause irreparable harm to the body and can even become the cause of disability! workout with a crossover of the biceps. In this case, the benefits of chin-ups will be best. And do not forget about weight. After reaching a certain threshold (for example, 30 pulls in a set), you can hang weights on yourself. 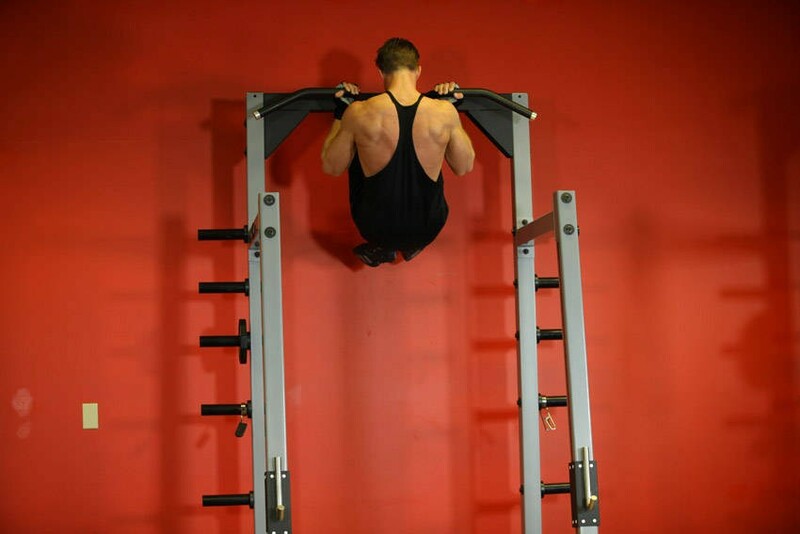 Chin-ups are a basic multi-joint exercise, due to which you build the dorsal core muscles. the load is evenly distributed between the rhomboid and the latissimus. 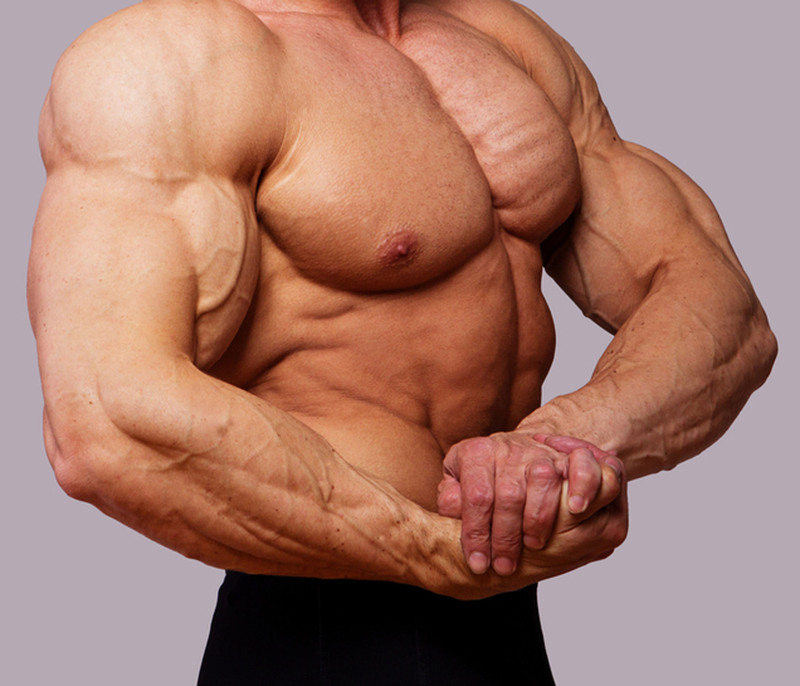 the bicep flexor is involved as much as possible. If we consider reverse pull-ups and chin-ups, then the situation is completely opposite. On the one hand – an overhand grip with the correct technique completely disengages the bicep flexor of the arm. This results in a big load on the back muscles – which makes them thicker and wider. The main load rests solely on the latissimus muscles. An underhand grip, however, involves additional muscle groups, and increases the joint load. Thus, for overall progress, it is much more effective. As for the building of the muscles of the back – then due to the strain of the load by the biceps, the back is worked out less. While both exercises take place in the vertical pulling movement plane, and they both primarily target the back (specifically the lats) and biceps, the way they do it is slightly different. Pull-ups typically use shoulder adduction, where the elbows come down and back from the sides. 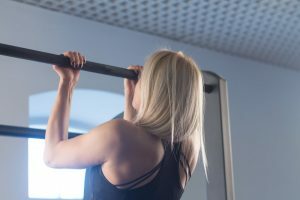 Chin-ups on the other hand use shoulder extension, where the elbows come down and back from the front (neutral grip fits in this category as well). The difference isn’t huge and it doesn’t make one exercise better or worse than the other. It just means that both exercises train the lats in a slightly different way. Your goal is to build muscle/get stronger (and avoid overuse injuries). It would probably be a good idea to avoid always neglecting one type of movement in favor of the other. So then, which will work better and faster for you? Well, putting the true best answer of “do what’s best for you” to the side for a second, experts say that the best (and safest) results come from using a mix of different grips. Maybe do reverse pull-ups for lower reps one day, and then chin-ups for higher reps another day. Maybe do chin-ups for 8 weeks, then reverse pull-ups for the next 8 weeks. If your gym has neutral grip handles available, maybe give that a shot for the 8 weeks after that and then start the cycle over again with chin-ups. Of course, if you find that a certain grip feels more or less ideal for you, you should make the obvious smart decision of using that grip more or less often. Whatever it ends up being, some type of vertical pulling movement (be it reverse pull-ups, chin-ups, or lat pull-downs) should almost always be a major part of your overall workout routine. A chin-up is considered both the simplest and most difficult exercise in sport disciplines. It’s simple – the fact is that many athletes misuse the elbow. Then get down, but do not bend your elbows to the maximum. In the presence of additional weight (in the form of irons), you should monitor breathing (inhalation in the lower phase, exhalation in the upper phase) and the position of the body. In particular, due to the displacement of the center of gravity, it is necessary to take into account the angle of ascent, and to force the flection in the lower back. In the case of training without weight, the lower back takes the correct position on its own. Despite the extremely simple technique, there are a number of mistakes that most athletes make. That’s why chin-ups lose most of their efficiency. Mistake # 1 – pulling with wrists. In this case, the load falls entirely on the biceps, while the back is resting. Chin-up turns from a basic to an isolated exercise. Mistake # 2 – bending feet or changing the position of the body. Many people, when they cannot pull themselves up, they begin to pull the body towards themselves. This changes the center of gravity and lets the muscles of the press move. You should never do that. Since the lumbar region is at this time in a stretched state, it is very easy to stretch or jam the ligament. 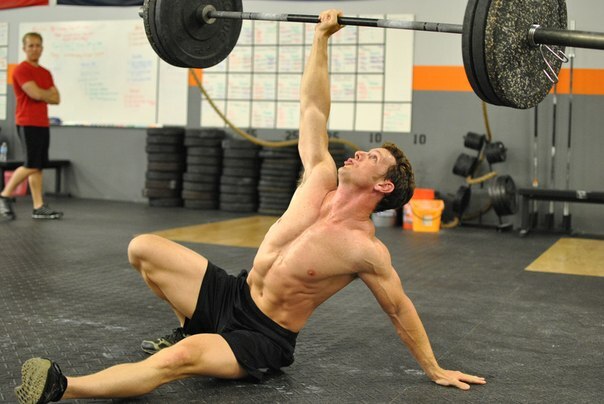 Mistake # 3 – you should never twitch on the bar. Reasons are described in mistake number 2. Mistake # 4 – too wide grip. In this case, the elbow joint works in an unnatural way, which can result in a dislocation and even a fracture. Mistake # 5 – the full unbending of the elbows. This is the most common mistake for beginners. It seems to them that in this case they get more load. However, this is not true. In this case, most of the forces go not to contracting the muscles of the back, but to overcoming the“30 degree” ligament barrier . The main mistake: the performance of chin-ups too quickly. It is believed that in this case, more muscles are loaded. This is so, and there is the ability to build faster, get more pumping and, most importantly, use fast fibers. But at the same time, there is a serious risk of spinal injury, because of its stretched state. Because of this, it is easy to get a pinch of the spinal disc. Perform smooth reps. No cheating. Did you get stronger or just better at swinging yourself up and looking like a stud in the process? Bonus: Add weight to your cheating chin-ups to fast track your way to needing shoulder surgery. The arms should be straight at the start of each rep but not a dead hang. Keep your shoulders in their sockets. In order to understand, do this: put your arms straight above your head; shrug up as high as you can; now shrug down. We don’t want our shoulders loose in that shrugged up position. It’s the ‘down’ position with the shoulders ‘packed’ that we want to keep throughout the set. When people say “dead hang”, what they actually mean is arms straight. Use a shoulder-width grip or slightly narrower. The finish position is where your chin goes over the bar, elbows brought down to touch your side but not past it. Your chest may touch the bar depending on limb proportions, but that is not a defining factor of a full rep.
Keep your glutes and abs tight. Tuck your neck, and do not cheat by craning your neck upwards as the reps get harder. You’re probably going to do it without realizing it, but try not to. No half reps. When you can no longer get a full rep, the set is over. Hang from a chin-up bar using an underhand grip (palms facing you) that is slightly wider than shoulder width. Now bend your knees at a 90 degree angle so that the calves are parallel to the floor while the thighs remain perpendicular to it. This will be your starting position. As you exhale, pull yourself up while crunching your knees up at the same time until your knees are at chest level. You will stop going up as soon as your nose is at the same level as the bar. Tip: When you get to this point you should also be finishing the crunch at the same time. Slowly start to inhale as you return to the starting position. Variations: You can also add resistance by holding a dumbbell or medicine ball between your feet but only the most advanced athletes should do this. Alternatively, when you are very advanced you can also try the one-arm version where you grasp your wrist with your free hand and you work the obliques more. Attach a weight to a chin belt and secure it around your waist. You can also hold a dumbbell between your feet. Grab the pull-up bar with the palms of your hands facing your torso and a grip closer than shoulder width. Your chest should be up and your back arched. This is your starting position. Now exhale and pull your torso upward until your head passes over the height of the bar. Ensure that during the movement you squeeze your shoulder blades back and down. Concentrate on squeezing the back muscles once you reach the full contracted position and keep the elbows close to your body. The upper torso should remain still as it moves through space and only the arms should move. Pause at the top as you inhale, and then slowly lower your torso back to the starting position where your arms are fully extended and the lats are fully stretched. 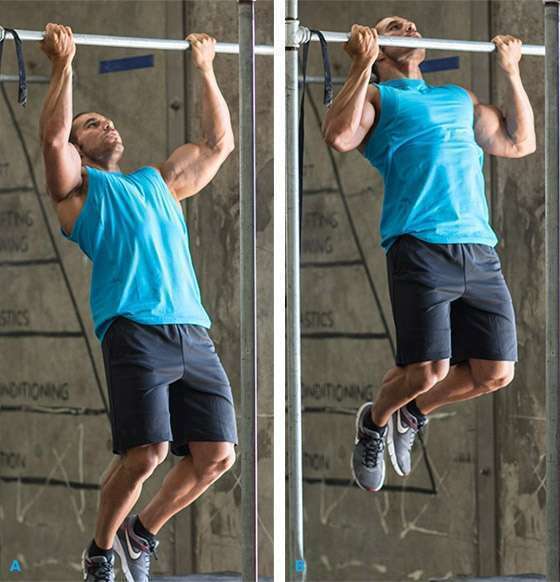 Regardless of whether you decide to do reverse pull-ups or chin-ups, keep the right technique, or alternate both exercises. Only in this case, the load on the back muscles will be evenly distributed. In case you notice that one of the sides of the back does not build as fast as the second one, compensate for the load by pulling up on one arm, or perform one-side pulls to the dumbbell belt.